Although I’ve been aware of Ann O’Loughlin’s previous novels and was sure I would like them, somehow I haven’t got around to reading any before this, her third novel. And I’m so pleased to say I was right: I loved this book and couldn’t put it down. The storyline revolves around three women and Ludlow Hall. Connie is a New Yorker who has suffered unimaginable loss and has fled to Ireland to live in the run-down Irish mansion her husband had bought without her knowledge. Eve is the former owner of the house who was unceremoniously thrown out due to her husband’s debts. Finally, Hetty owns the local B&B and is the widow of Barry, who was very much liked and respected in the local community. The Ludlow Ladies’ Society used to meet in Ludlow Hall and is a crafts group made up of lots of local women. They are desperately in need of a new home with lots of space to work on their latest project – memory quilts which they hope will lead to them meeting Michelle Obama as winners of a festival competition. The first thing to say about this book is that it is a very emotional read. All three of the women have lost their husbands and are coping – or not – in different ways. The three main characters all had suffered loss and so much sorrow. It is hard to imagine how they could come to terms with what had happened in their pasts but their shared stories helped them to bond and support each other. There were many secrets they didn’t want to reveal because they were too painful, too humiliating or too private. But by opening up to each other, they begin to heal through the non-judgemental, accepting friendship they offered. The author’s beautiful way of writing made feeling all the emotions along with her characters inevitable. This is also a book about memories, treasuring the happy times and learning to live with unhappy memories. Reading about Eve’s button box brought back memories of my Gran’s button box which I used to love to play with. I imagine that many people will have similar happy memories. In those buttons were the memories of all the garments they belonged to. In the same way, the fabric used in the memory quilts made by the Ludlow Ladies held memories of people, places and events precious to the individual members and the community. Towards the end of the book came revelation upon revelation. Some I had guessed at but others took me by surprise just as much as the characters. Yet nothing seemed out of place or unbelievable. All the parts of the story came together flawlessly to create whole in much the same way as the diverse pieces of fabric came together to make a completed patchwork quilt. The characters seemed very real to me and I shared in their pain, their laughter, their hopes and their healing. 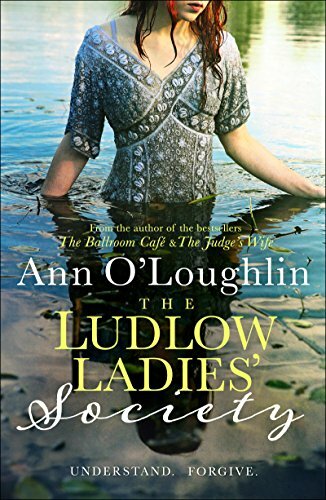 If you haven’t read anything by Ann O’Loughlin before – and even if you have – I really recommend you get yourself a copy of The Ludlow Ladies’ Society. I will definitely be making time to read the author’s previous novels and will be looking out for any future books. My thanks to Sophie Goodfellow for my copy of the book. The Ludlow Ladies’ Society is published by Black and White Publishing and is available now in paperback and as an e-book. You can buy at good bookshops, from B&W’s website or on Amazon where at the time of writing the Kindle version is an amazing 98p (though please do check before buying). Oh absolutely, it was a completely wonderful read. This sounds fun and exciting!